As Fred Wilson wrote over the weekend, Janet Yellen, the Chair of the Board of Governors of the Federal Reserve System (the Fed), indicated last week that the Fed would likely increase the federal funds rate, which has hovered around zero for the last seven years - since the collapse of Lehman. In the last 35 years, the federal funds rate has varied from as high as 16% in 1981 to as low as 0.09%. throughout those cycles, venture capital has flourished from a cottage industry into $100B per year asset class. VCs are on track to invest as much capital this year as during the height of the dot com era. But, is there any observable relationship between the federal funds rate and the startup ecosystem? 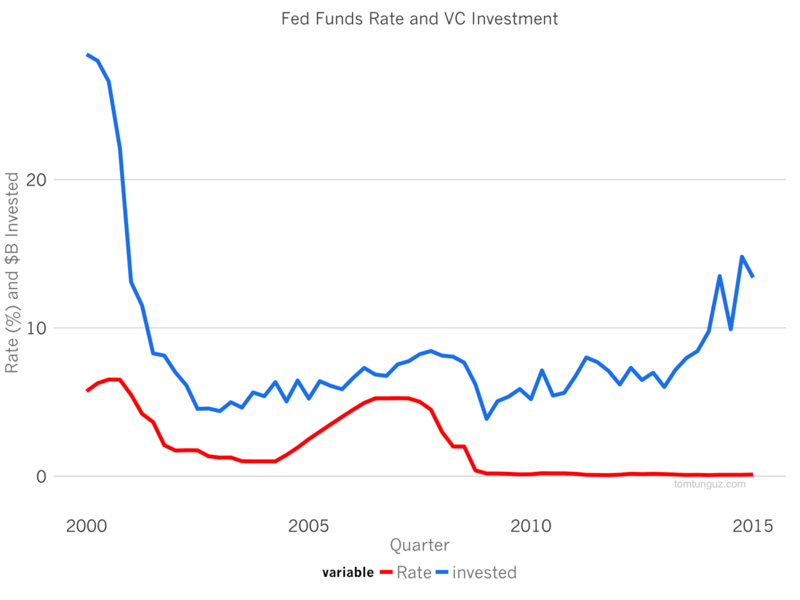 The chart above shows the federal funds rate starting in 2000 through 2015, compared to the dollars in billions of venture capital investment. 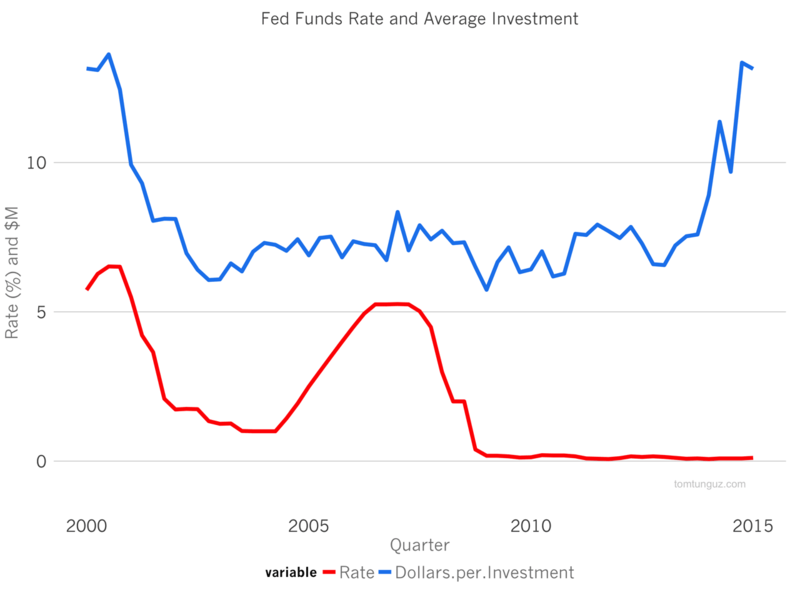 From 2000 through 2009, the federal funds rate and venture investment paralleled each other. At the height of the bubble, interest rates were relatively high. When the technology bubble crashed, the Fed pursued a strategy of reducing interest rates in order to spur growth. 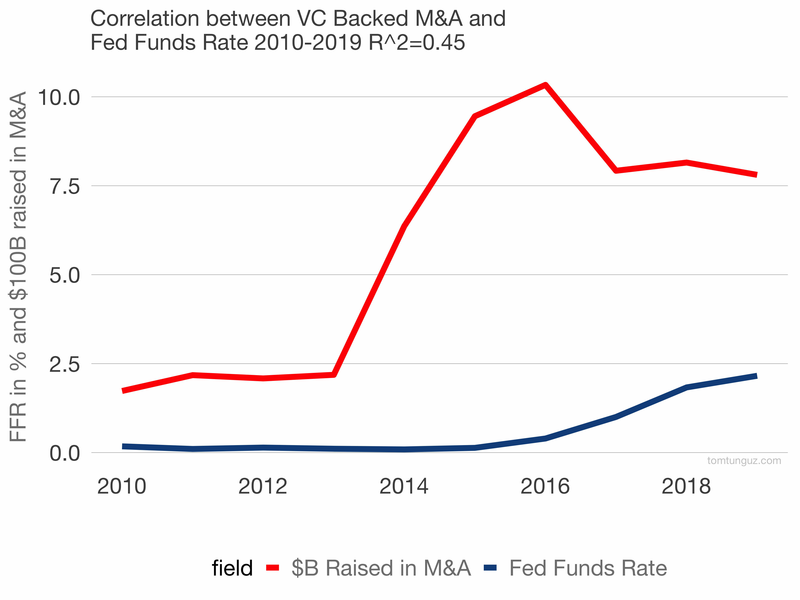 Because venture capitalists viewed the environment is less rosy than before, and limited partners also invested less in venture capital, the amount of venture capital investment declined with rates. When the economy started to pick up steam again, rates increased and so did venture capital investment. But, since the start of quantitative easing, the relationship no longer holds. Separately, there’s no strong relationship between the Fed Funds rate and exits. See the chart for IPOs and M&A. As for the impact on valuations, the plot above shows the average investment across all rounds over the same timeframe, compared to the federal funds rate. It would be hard to draw any kind of relationship between these two trends. We do know however, that the recent spike in average investment size is driven in large part by the growth of mega rounds, and the influx of capital from nontraditional venture capitalists, whose investments now account for about 40% of dollars. This non-traditional capital from mutual funds and hedge funds and other financial investors is the capital source most likely to be affected by short-to medium-term changes in interest rates. Unlike traditional VCs, whose investors commit to 10 year funds for investment in startups, nontraditional investors can invest across a broad range of different asset classes, and can quickly decide to invest their dollars elsewhere. If these late stage investors were to leave the market, growth multiples would likely contract as the supply of investment dollars would decline. But, it’s impossible to say how long such a decline would take, or predict the magnitude of such a change. 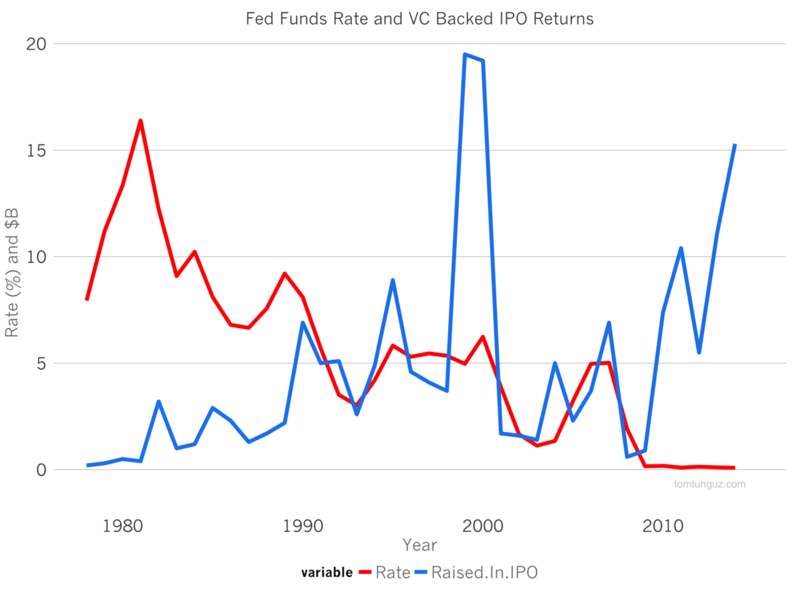 The data indicates movements in the Fed Funds Rate aren’t predictive of startup investment. So, changes in the fed funds rate aren’t likely to have an immediate impact on startups and their ability to fund raise. But at some point, the fund raising market dynamics will change, and the canary in the coalmine are the late stage investors whose dollars aren’t constrained to/focused on startups.